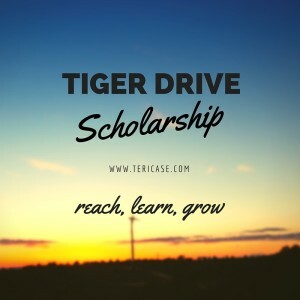 The Tiger Drive Scholarship is for someone who is going to college (or trade school) and isn’t afraid to look beyond what is familiar in his/her life to reach, learn, and grow. And hopefully, someone who will pay it forward some day in some way. I am thrilled to offer The Tiger Drive Scholarship for the fifth year. I am now accepting applications for students graduating from Carson High School and Pioneer High School in Spring 2020 and attending a college, university, or trade school in Fall 2020. APPLICATION DUE DATE: The application must be completed and returned to Teri Case via teri@tericase.com or given to the high school’s counseling department no later than – Please check with your school counselor for the annual deadline. APPLICATION: The application is available in the Carson High School Counseling Department as well as the Pioneer High School Counseling Office. SELECTION CRITERIA: The minimum of a $300* scholarship will be based on an applicant’s financial need, academic performance, work experience, extracurricular activities, and education plans. Only Carson High School or Pioneer High School students in Carson City, Nevada, graduating in the Spring of 2020 with a GPA of 3.0 or higher and attending a trade school, college or university full-time in the Fall of 2020 will be considered. Special consideration will be extended to students who live on Tiger Drive in Carson City, Nevada. This is a one-time award. DONATIONS: The past several years, I was overwhelmed in all the right ways by unexpected donations from kind-hearted friends and strangers. I am super excited to announce that a portion of the proceeds of my novels, Tiger Drive and In the Doghouse: A Couple’s Breakup from Their Dog’s Point of View will help fund the Tiger Drive Scholarship! Purchase my novel Tiger Drive. A portion of the proceeds helps fund the scholarship. Purchase my novel In the Doghouse: A Couple’s Breakup from Their Dog’s Point of View. A portion of the proceeds helps fund the scholarship. If you’d like to make a donation by credit card, you can send it to Teri Case’s PayPal account – please include comments which high school you’d like your donation to go to, Carson or Pioneer. Carson High School, c/o Counseling Dept., 1111 N. Saliman Road, Carson City, NV 89701, (775) 283-1915. Pioneer High school, c/o Counseling Dept., East 202 Corbett Street, Carson City, NV 89706, (775) 283-1300. For updates, announcements, and more, please subscribe here. *Pioneer High School recipient is a minimum of $150 scholarship. Carson High School recipient will receive a minimum of $300 (it’s my alma mater).